Like much of the South, Little Rock, Arkansas is in the heart of SEC football country. The Razorbacks play most of their home games 2 and a half hours away in Fayetteville, Arkansas, where the University is located. Typically once per year, the NCAA team will come down to Little Rock and play in War Memorial Stadium, located in the center of the state’s most populated city. Other than that, the stadium is without a high profile primary tenant. This vacancy created an opportunity that the Little Rock Rangers of the National Premier Soccer League filled. Despite being a metropolitan area of over 700,000 people, Little Rock has very limited sports entertainment options. The Arkansas Travelers minor league baseball team, which plays in the Double-A Texas League, is pretty much the only competition directly in town. The Little Rock area has a vibrant youth soccer community, and Jonathan Wardlaw’s intentions around starting the Rangers were to give a higher level option of play to the area’s older soccer players while providing role models for the younger players within the central Arkansas area. Given the relative lack of sports entertainment competition and the enthusiasm for youth soccer, perhaps it should be less of a surprise that when Wardlaw organized the Little Rock Rangers first match versus Memphis City FC, attendance outstripped expectations, reaching an estimated 4,000. 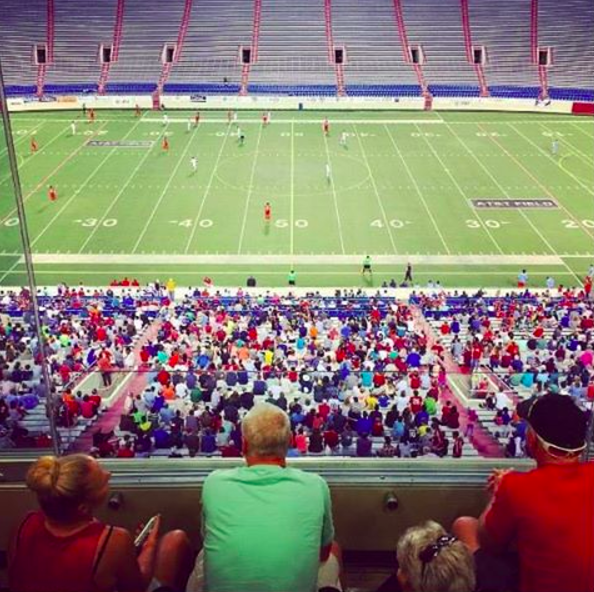 An average attendance of 1,000 is strong for the NPSL, so a 4,000 debut and regular crowds over 3,000 put Little Rock in its first season into territory only seen by Chattanooga, Detroit City, Tulsa and Grand Rapids. 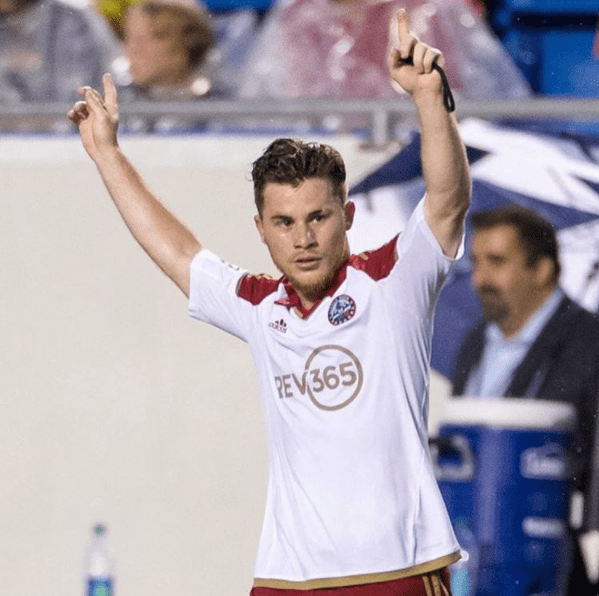 As the Rangers enter their second year, Wardlaw looks to Chattanooga FC’s sustained success in a similar market as the model for Little Rock. 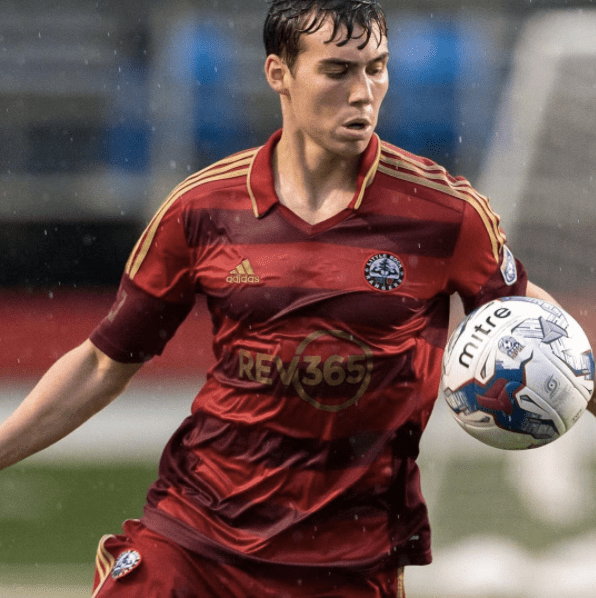 Midfield Press was able to speak with Jonathan Wardlaw, President of the Little Rock Rangers to discuss the club’s past, present and future. I have two school aged boys, an 8 year old and an 11 year old. The past couple of years, the 11 year old has been playing in travel leagues and tournaments. We’ll normally travel as far as Memphis, Dallas and sometimes Tulsa. It’s basically the same as when I was growing up – we’d have teams that were doing well in the area, and then when we travel out of the state we’d get smoked. We have to do something to improve the level of play here in central Arkansas. Player development at the 8-12 year old age needs to be a big focus and there is a lack of exposure in some of the rec leagues. There’s a big Hispanic community here but those kids play in their own rec league and the kids have little to no exposure to the traveling club teams. There were a couple of guys on our team last year who are 28 and 32 who grew up in the Hispanic League. Being mechanics by trade, there’s no doubt in my mind if something like this been in place when they were younger, they could have received free rides to college. Another focus needs to be on the fact we’re losing kids to other sports. I think one of the issues is there’s nothing higher level here to draw them in and keep them interested in the sport. Hopefully we can play a part in that. On top of the those things I just love the sport myself. I just wanted to build the club and see if I could introduce the sport to many of the people in Little Rock who are unfamiliar with soccer. Arkansas has been known to have some passionate and rowdy fans and I feel central Arkansas is just itching to rally behind something and call it their own. Maybe the Rangers are what they are looking for. War Memorial Stadium. It is in the heart of Little Rock and is surrounded by a public golf course and the Little Rock Zoo. Also it’s in an area that has a ton of shopping and restaurants. Way back when the University of Arkansas used to play in the Southwest Conference with all of the larger Texas colleges and Universities, the stadium was used so the Razorbacks could play a few games per year in Little Rock. They used it as a recruiting tool to lure some of the South Arkansas and Texas kids to Fayetteville where the U of A is located. Currently the Razorbacks are only in contract with the stadium for one game per year until 2018. Rumors are the U of A is not wanting to renew and the city and stadium officials are looking for something as an “anchor” for the stadium. The city and stadium management have been great about supporting us with fair rent, allowing us to bring food trucks in. They are simply letting us do our “thing” while we try to build a fan base and get our club off the ground. We offer local craft beer at our games. It’s just a really awesome situation. 3. What is your competition in the market? We have a minor league baseball team here and that’s it. We do our best to not “compete” with them on game nights, but I don’t really think our crowds overlap that much. Per capita, we have a huge amount of millennials and that’s one of the crowds who I wanted to engage. The local flavors of craft beer and food trucks have helped on that and I hope to eventually work some live music into our tailgates. There is also a ton of youth soccer here. There are three to four big youth clubs, and within 40 miles of Little Rock there are even more. There’s a huge soccer fan base out there. My goal was to just make a competitive team in year one and not have any blowouts and risk losing some of their interest. We did that and basically missed the playoffs by one goal. All of our losses (except one) were by one goal and if we had turned one of those losses into a tie we would have qualified for the playoffs. 4. What does attendance look like during a typical match? What was your best attended match and the circumstances around it (including the attendance #s)? Our inaugural game was against Memphis City. We sort of planned that we would do a dry run against each other to work out the kinks on the operations side before the conference season started. I think every news outlet showed up for the game and they wanted interviews on the field, so I got caught up in that and had no idea what our pregame tailgate looked like outside. I also had no clue what kind of crowd to expect, so I took advantage of our league sponsorship with Staples and had our 2500 paper tickets printed on business cards. I recruited family members to help manage the ticket booth, and I got a text message from my mom while talking to the press that we were running out of paper tickets. The actual attendance for the first game is unknown because we had to start recycling the tickets. Good problem to have I guess. I had my nephew standing at the gate and once the attendants collected a decent amount he would run them back to the ticket booth to be resold. Based on the 2500 paper tickets and season tickets sold, I’m comfortable saying that we had no less than 4,000 that first game. I also took a photo of the crowd from the other side of the stadium and compared it to the capacity numbers from each section of the stadium and 4000 looks to be pretty close. The crowds kind of leveled off after that. Attendance was steady at 2500-3000 with the exception of two games. One it was pouring rain (about 500 fans), and the other, storms were forecasted (about 2000 fans). We have a supporters’ group called the Red Order and it took a game or two for them to get organized, but they eventually did, and they are an awesome addition to our game atmosphere. When the Memphis team came to town and their supporters group showed up with their drums and we had none, it inspired some of the local fans to get organized and do the same on their own. Game number two, some guys started showing up with drums, and then they started coming up with songs and chants. I did not want to have any part of orchestrating a supporter group from a front office or anything forced upon the fans like that. It was very important to me for it to form organically. It did, and it was pretty cool to watch the evolution. To my delighted surprise we actually made some money this year. I invested it back into the club by buying our own screen printing equipment so that I can control merchandise inventory a little better. But most importantly we also bought into the women’s side of the sport with a WPSL franchise and I’m looking forward to see what we can do in that league. There are several successful women’s college teams in our area and hopefully we will attract some of that talent. As far as the future of the men’s side of the club, I think what we have in the NPSL is really cool and I understand the promotion/relegation side of things. It is important to me that we try to support and promote that sort of a league. However, knowing Arkansas fans the way I do, if we become successful on the field and in the front office, they will want a pro franchise and I will have to listen hard to the fans. Hopefully the NPSL will have some answers for that in the not too distant future. Regardless if we do move on up the so called pyramid, we will always have an NPSL presence that I will make sure we never lose. We are also in the process of starting up a youth component. Hopefully we can grab some sponsors’ attention and provide an outlet for the local youth who can’t currently afford to play the sport. 7. What does the club’s current investor profile look like? It is basically my wife and me with several key family members and volunteers on games days. We are set up as a non-profit 501(c)3, and went to friends and family when I was dreaming this thing up and asked for donations. I started this in 2016 and coincidently 16 families donated to this club’s start up. That is what the 16 on our crest represents, the 16 founders and they can be found at the bottom of the home page on our website. 8. Have you spoken with investors about moving the team up to USL or NASL? No, I haven’t been approached by any investors. Although, I have recently been in touch with some officials within the city’s and state’s offices. Many of them are fans of our club and to my surprise attended many of our games last year. They have some exciting ideas of ways we could partner together on some projects. 9. Would the current venue hold up if you moved to USL/NASL or would you need to find a new home? If so, are there existing stadiums you could use in your area or would the investors need to build a new one? Other than the field being a little narrow, War Memorial Stadium is more than adequate in that it currently seats nearly 55,000 fans. We’d need to widen the field and re-turf it so it has no permanent football lines. It has a newly renovated 3 story press box. It has private sky boxes, indoor club seating, many concession areas, and large locker rooms. It was built to support the University of Arkansas, so it meets that standard. We’re able to stream games online with multiple camera angles. It’s hard wired and set up for SEC football. It is a great recruiting tool for our team. 10. We have recently seen informative write ups on the financial and operational aspects of successfully running a lower league team by the owners of the Kingston Stockade (NPSL) and Minneapolis City SC (PLA) in an effort to “open source” a soccer success formula to communities around the country. Little Rock Rangers also debuted in NPSL this past year – what are some of the most important lessons you learned and what advice would you give to folks looking to start a similar club in their home town? Line up as many interns as you can. Get a graphic design intern. Get a sports management intern. Get a journalism intern. You get the point. Game days are so crazy and you need all the help you can get. Most likely you aren’t going to make enough money to start hiring people immediately, so you need as many volunteers as you can get. Recruit people to help with simple things like social media. Pick a tone or personality on social media and stick with it. Have a plan on how you are going to communicate. Consult a graphic designer and come up with several social media post templates before the season starts. Have a general announcement template, player announcement template, upcoming game template, etc. 11. What else should the readers of Midfield Press know about your club? We’re just doing our part to grow the game in our area. We are in the South competing with SEC football, baseball and basketball. Don’t get me wrong, we are Razorback football season ticket holders and enjoy an American football game as much as the next person. We just want to make the quality of play better down here and keep some of the kids in soccer that might have moved on to the more traditional sports. Sometimes I just feel that soccer is a stepping stone to other sports down here. That, only the young kids play as a foundation builder of sorts and then move on to something else. We are going to do our best to change that.